This certification requires an applicant to be in the basement waterproofing industry for at least four (4) years. He (she) must also be employed by a company who is a current member of the Basement Health Association. He (she) must study the books and publications that are listed in the CWS Study Guide. The applicant can take a test by attending one of the BHA Regional meetings or at our Annual Convention at the WOC in Las Vegas. Once Certified an individual must obtain at least 15 credits every 2 years in order to maintain their certified status. This ensures the homeowner that our Certified Waterproofing Specialist is on the cutting edge of the latest technologies and products. Apply today by calling (800) 245-6292! This certification requires an applicant to be in the foundation repair industry for at least four (4) years. He (she) must also be employed by a company who is a current member of the Basement Health Association. He (she) must study the books and publications that are listed in the CSRS Study Guide. The applicant can take a test by attending one of the BHA Regional Meetings or at our Annual Convention at the WOC in Las Vegas. Once Certified an individual must obtain at least 15 credits every 2 years in order to maintain their certified status. 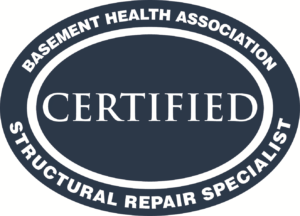 This ensures the homeowner that our Certified Structural Repair Specialist is on the cutting edge of the latest technologies and products. Apply today by calling (800) 245-6292! 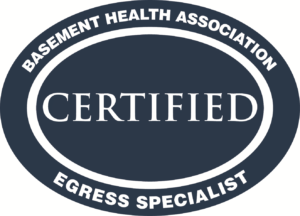 This certification requires an applicant to have at least one (1) year experience in egress installations. He (she) must also be employed by a company who is a current member of the Basement Health Association. He (she) must study the publications that are listed in the CES Study Guide. The applicant can take a test by attending one of the BHA Regional Meetings or at the Annual Convention at the WOC in Las Vegas. Once certified an individual must obtain at least 15 credits every 2 years in order to maintain their certified status. This ensures the homeowner that our Certified Egress Specialist is on the cutting edge of the latest technologies and products. Apply today by calling (800) 245-6292! He (she) must also be employed by a company who is a current member of the Basement Health Association. He (she) must watch the (9) nine videos and sit through a pre-test. The applicant can take a test by attending one of the BHA Regional Meetings or at the Annual Convention at the WOC in Las Vegas. Once certified an individual must obtain at least 15 credits every 2 years in order to maintain their certified status. 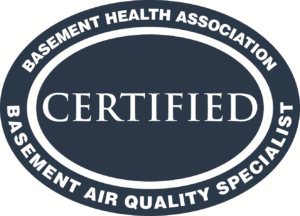 This ensures the homeowner that our Certified Basement Air Specialist is on the cutting edge of the latest technologies and products. Apply today by calling (800) 245-6292!